Kara-Balta (lit. 'black ax', Russian and Kyrgyz: Кара-Балта) is a city and municipality on the Kara-Balta River, in Chuy Region, Kyrgyzstan, the capital of Jayyl District. It was founded in 1825 under the Kokand Khanate, and received city status in 1975 under the Soviets. Its city population was officially 37,834 in the 2009 census. The municipality had a population of 54,200 according to the Soviet 1989 census. Kara-Balta is located on the northern slopes of the Kyrgyz Ala-Too, in the western part of Chuy Region, 62 km west of the capital of Bishkek. The road continues west through Kaindy toward Taraz, Kazakhstan. Another road goes south through the Töö-Ashuu Pass and then splits, one branch going west to Talas Province and the other south and then east through the Suusamyr valley to Balykchy on Lake Issyk Kul. It has a temperate climate. The terrain is flat, with a slight slope downwards from the south to the north. The Chuy Valley has been settled since the Fifth Century, but after the invasion by Genghis Khan the area was inhabited mostly by nomads and pastoralists. However, the settlement became a town and flourished under the Khanate of Kokand. Kara-Balta has a hot, dry-summer continental climate (Köppen climate classification Dsa). The average annual temperature is 9.7 °C (49.5 °F). The warmest month is July with an average temperature of 23.3 °C (73.9 °F) and the coolest month is January with an average temperature of -4.8 °C (23.4 °F). The average annual precipitation is 414.1mm (16.3") and has an average of 99.2 days with precipitation. The wettest month is April with an average of 60.9mm (2.4") of precipitation and the driest month is August with an average of 12.2mm (0.5") of precipitation. Source: "The Climate of Kara-Balta". Weatherbase. Retrieved 1 August 2014. The major industry in Kara-Balta was the processing plant of the mining combine, Kara-Balta Ore Mining Combine (KBMP), the largest in Central Asia. During Soviet times, it processed uranium ore from deposits in Kyrgyzstan and Kazakhstan. After independence, the mines in Kyrgyzstan closed quickly; however KBMP continued to process uranium concentrate from Kazakhstan until 2005 when this activity was stopped due to the lack of raw material. The massive uranium tailings remain a problem. KBMP still processes gold and molybdenum ores. In February 2007 the Russian Renova Group won a tender to purchase the Kyrgyz government's 72.28 percent stake in the Kara-Balta uranium-production facility. 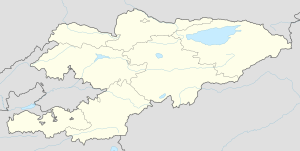 Kara-Balta is located along M41 on the route from Bishkek to Osh. It is also connected by highway to Taraz, Kazakhstan. Kara-Balta is connected by rail to Bishkek and Taraz, Kazakhstan. During the Soviet period city had a good sport infrastructure. The city has a bandy club. In the city the Russian military has a capacity. This article is based in part on material from the Russian Wikipedia. 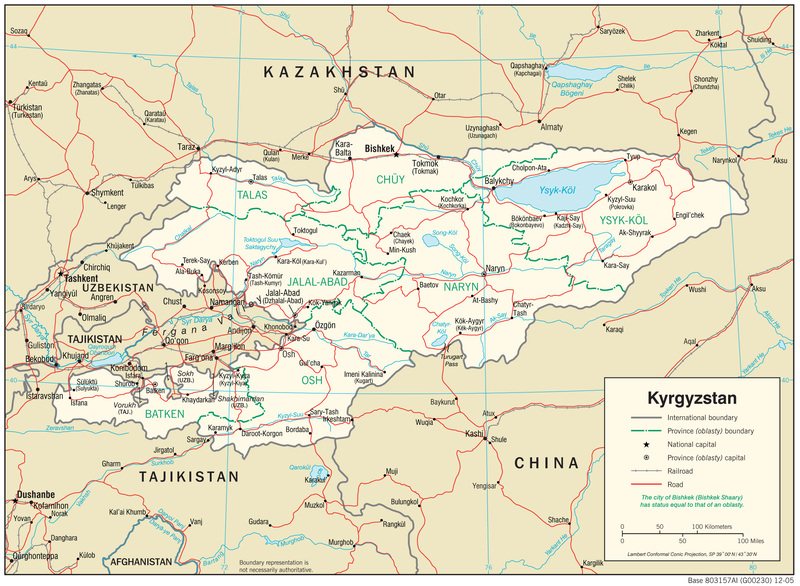 ^ "2009 population census of the Kyrgyz Republic: Chuy Region" (PDF). Archived from the original (PDF) on 10 August 2011. Retrieved 2010-03-12. ^ "Weatherbase". weatherbase.com. Retrieved 1 August 2014. ^ "Google Maps". maps.google.com. Google Maps. Retrieved 1 August 2014. This page was last edited on 15 January 2019, at 08:09 (UTC).